Ink Colour: Black, Red, and White etc. Application : Extremely useful on Carton Taping Machine for Online coding of cartons. As per the needs and requirements of our clients, we are involved in providing Online Auto Coder. SSKPI provides compact fully automatic LCD based PLC coding system for on line registered printing on continuous (FFS) Form Fill Seal Machine for Milk, Biscuit Wafer, Oil, Mineral water and Conveyor system etc. Technical Specifications : 3 or 4 Line printing Speed:Up to 100 operation/minuteCharge Of Ink :230/250 VAC 50 c/s, Single phase.Charge Of Ink :10 ml apron.& it prints more than 10, 000 impressions per charge of ink.Element :Specially manufactured Vilax cylindrical Cartridge made from best quality imported base material. Our company supplies one of the best pneumatic coder which can be availed from nowhere else. 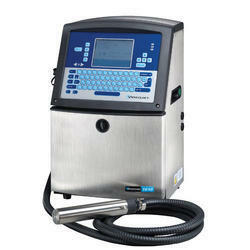 We also offer horizontal type pneumatic coder and that too in quite reasonable prices. 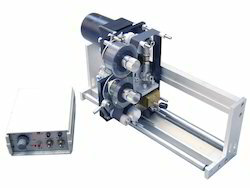 We are also one of the renowned pneumatic table top coder suppliers in India. We are offering Coding Machines to our clients. Supply Voltage: 230 Vac + 10%, 15 VA,230 Vac + 10%, 30 VA.
With the help of our expert team members, we have been able to provide Manual Coding Machine. for Curved surface like Containers/ Bottle.